During a landout in a glider, you may find yourself in a hostile environment from several hours to several days. While most US pilots think of the desert or Rockie Mountain areas as the likely place for an extended stay to occur, it can just as easily happen closer to home. In April, 2007 an experienced glider pilot went down along the heavily forested Alleghany Mountains in Pennsylvania in which he was injured and was forced to spend a night in freezing wet weather when rescuers were unable to locate him. While I suspect (and pray) that I will never need a survival kit, I decided that having something in the glider is simply good insurance. This may harken back to my Boy Scout days and their moto of "Be Prepared". 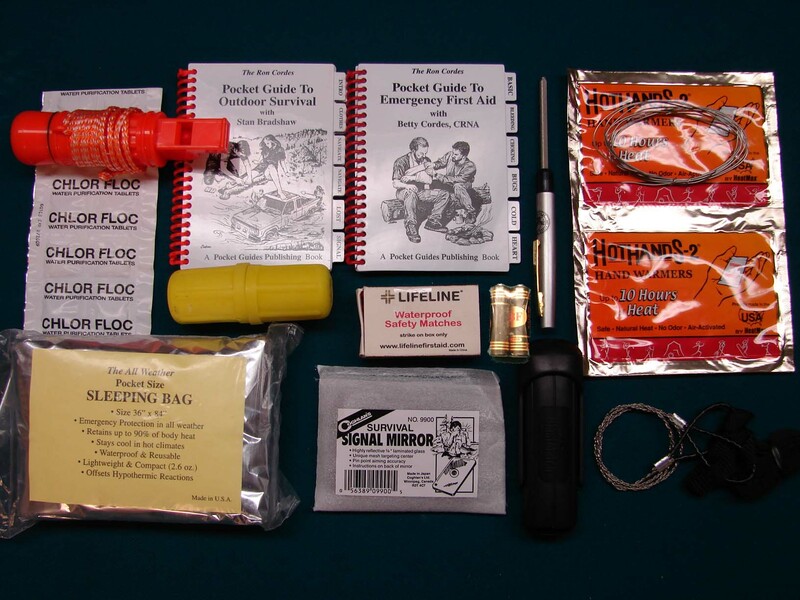 Below are lists and pictures of the items which are in my compact survival kits. I broke the items into two survival kits. One kit is strictly for the "wilds" of Northern Illinois and is on board at all times. The other kit will be aboard when I fly in more inhospitable and mountainous locations. There are a few duplicated items (3 rescue whistles! 3+ fire starters! 3 compasses!) but more is better to a great extent. Many of the items I list have links to the site where they can be purchased. Many thanks to others for their suggestions and comments. Be prepared because you just never know. Good luck! Glider Survival Kit #1 - Local Midwest Flying - See pictures below. Small First Aid Kit - There are several good medical and survival kits on the Adventure Medical Kits web site. Local road map - It can be a great help to rescuers if you are able to give them directions. GPS coordinates are even better. Gloves - While a thick pair would be nice, they are obviously bulky. Therefore I pack the "Jersey" style of thin work gloves available at hardware stores. They are cheap, pack nice and thin and are surprisingly warm. Flashlight - Preferably an LED type. LED (light emitting diode) flashlights are less likely to break and last longer on a set of batteries. I use a 2xAA cell model. The Maglite brand is robust, and now have LED models plus LED retrofit kits for older units. Use quality batteries and check them at least once a year. Poncho - Can be used as a rain coat or a ground cloth. Insect Repellant - I like the towelette wipe type packaging as they don't leak or go bad. Backback - You can find lightweight collapsible/foldable mini-backbacks which would be very useful for carrying items if you had to hike out of somewhere. Wire - Handy for lots of uses. I use aviation stainless steel wire as it is inexpensive, tough and won't rust. Nylon rope (small diameter) - Also handy for lots of uses. Note that your parachute has 100's of feet of canopy risers which can be used in a pinch. Multi-knife - My favorite knife in this category is the SOG "PowerPlier" line. See this web site for details. Other popular common brands are Leatherman and Swiss Army. "Sardine Can" Survial Kit - Includes one each of: Acetaminophen, adhesive bandage, alcohol prep, antibiotic ointment, book matches, tea bag, chewing gum, sugar, salt packet, energy nugget, duct tape, fire starter cube, wire clip, first aid instructions, fish hook and line, note paper, pencil, razor blade, safety pin, whistle, compass, reflective signal surface and waterproof bag. Carry Case - I like clear vinyl cases so that you can easily see what is inside. I found a really tough case (7"x11") at Berland House of Tools in the Chicago area. See this web site for store locations. Note: these cases are not waterproof. I found a very similar case, but not quite as tough, at office supply stores near the coin tubes and such. Also see this waterproof option. Glider Survival Kit #2 - Rugged Location Flying - See pictures below. Rescue whistle - This model also contains a waterproof match box with rubber gasket, small signal mirror (inside the match box cap), liquid filled luminous dial compass, Shrill signal whistle (ball type), fire starter flint bar, nylon lanyard. Sewing kit - Seems like a strange thing to bring along but it can be very useful to suture wounds. Ouch! Options: Add a curved needle. Buy real suture material at a medical supply store. Use: Clean the wound. Double up on the thread to add strength. Sterilize the needle with an alcohol wipe or at least a match. Cable Saw - Very compact and does a great job of cutting firewood. Insect Repellant - Small wipes type packaging. Survival Books - According to this site Ron Cordes' Pocket Guide to Outdoor Survival "...is the best fully waterproof manual in print...". 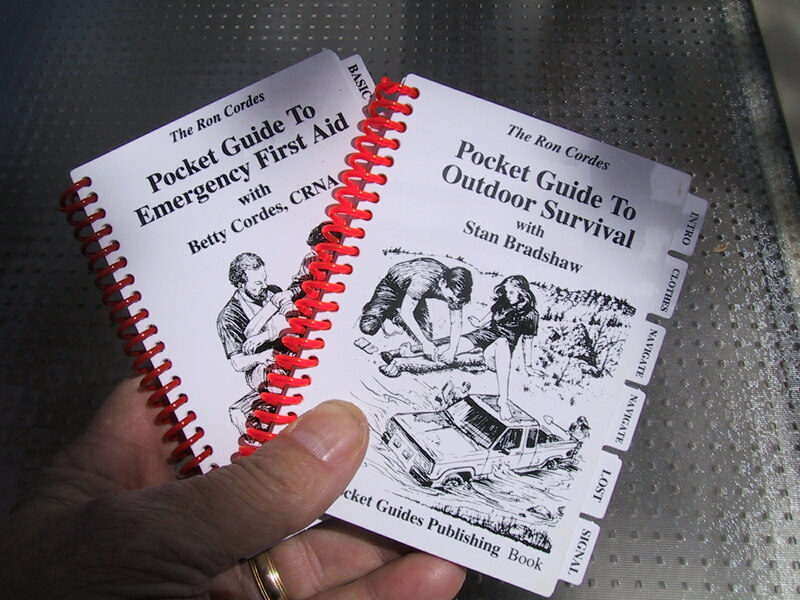 This book is very small, only 4-1/2" x 3-1/2" (11.5cm x 9.5cm), which will fit nicely in your emergency kit There is a companion book Pocket Guide to Emergency First Aid. See this picture. They are both available from Amazon.com. Carry Case - I found a tough clear vinyl 7"x12" case at Berland House of Tools in the Chicago area. See this web site for store locations. These cases are not waterproof. I found a very similar case, but not quite as tough, at Office Max near the coin tubes and such. Also see this option. Note: My parachute (a Strong 305 Paracushion) has a zippered pouch located along the back side which can hold a few items. Strong can retrofit this to your parachute. The Parachute - You may not think about it but the parachute itself can be a lifesaver. There is cloth (the canopy) and string (the risers) which all can be used in one way or another. Personal Locator Beacon (PLB) - Some type of GPS enabled locator is really a must and basically a modern manually operated ELT. The 408Mhz PLBs GPS based units with GPS encoding are the best (IMHO) and relay your position to orbiting satellites. They are waterproof and also (for category 1) float. The brand I like is from ACR Electronics. You must register your PLB and contact information at a free online NOAA database. Change your registration as often as you like when you re-use your PLB for boating, sking, traveling, etc. See this site for more PLB details. The only issue I have with PLBs is that they are not self activated like ELTs in the case of a crash. An increasingly popular alternative to PLBs is the SPOT, however I still currently prefer PLBs. Please see my presentation on a comparison of ELTs, PLBs and the SPOT. S.M.A.K. Parachute Kit - A great kit manufactured by Alan Silver (often seen at SSA conventions) which clips to your parachute harness. 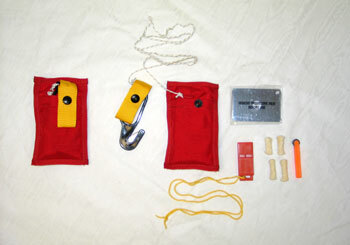 The kit contains; nylon case, hook knife on landyard, artificial flint and tinder, rescue whistle on landyard and a signal mirror. If nothing else makes it down from a landout beside you and your parachute, this kit may be your only friend. See this web site for details. Flashlight - Single cell AAA size Maglite. Compass - This is an incredibly small and indestructable pellet type compass. Cell phone - Charged and with spare battery. The Motorola RARZ like phones are great as they slip into a pocket and aren't thick and bulky. Contact numbers - This is especially important during contests with many new numbers to try to remember. I tend to carry a PDA with this information (which is seperate from my flight PDA) but a piece of paper will do. Space blanket - I had to unfold this to fit it into my parachute to prevent its bulk from being felt. Water - I use the Camelback "Unbottle" in my glider. I also have a second one to be used for rugged locations. If I am separated from my glider, I may loose this resource. I will need to find some dehydrated water. Just add water! Keep fairly well (while they can get hard over time, they are still edible). Be sure to keep them in as airtight container as you can like a zip-lock bag. Do you have some other food ideas? Please send them to me. Ultra Sil Dry Sack - Waterproof case (8"x12"). This is to replace the non-waterproof vinyl cases I am currently using. This one is nice as it is transparent (which is not obvious from the images). Alternate use is to haul water. Miniature tie down kit. I own The Claw which is tremendously strong but too large and heavy to carry in my glider. A friend of mine built something out of short fiberglass poles which I will have to investigate. Another option which was suggested were garbage bags which can be filled with rocks or dirt (buried if possible) and tie it to a wing tip. Alternate use for the garbage bags are as ground clothes. Glow sticks - Do they leak? Reading material - REALLY! Waiting for a retrieve can get really boring after reading the glider's operations manual cover to cover for the 8th time. Flare - I am unsure if I want that in my glider. Do they make miniature versions of a standard road flare? The best all around independent web site on survival that I have found is the Equipped to Survive site. As far as I can tell they don't sell much of anything, they just supply information and reviews. All about ELTs. Also see my presentation on the subject of ELTs and PLBs. What would you add? Send email to john@derosaweb.com with any questions or comments. 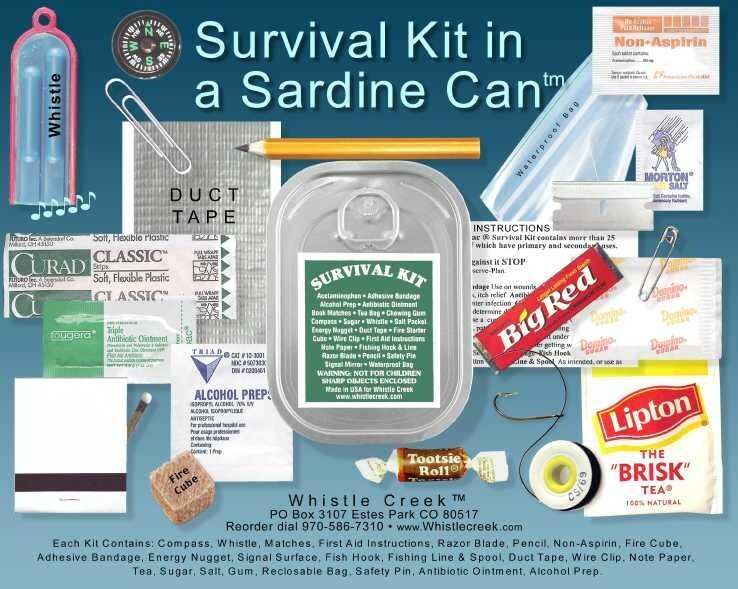 "Sardine Can" Survial Kit Waterproof Survival Books.